Santa’s homeland is the stuff of fairytales. Snow-dusted pine forests, cosy log cabins, and more reindeer than people, all add to the magic. Even with only a day to spare Fahy Travel has a trip to help visitors fit in as much as possible. Whether it is joining an elf school, decorating cookies with Mrs Claus, or zooming down ice slides, visitors will find all the magic on these trips. The magic begins as soon as visitors touch down where they will be greeted by Santa’s elves and whisked off to Rovaniemi’s Santa Park, where they will be given their own Lappish passport as a souvenir. 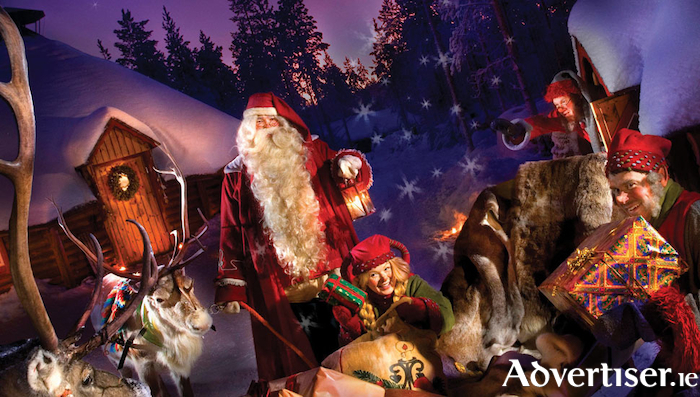 Rovaniemi’s Santa Park is where Santa and his elves spend their days making toys and getting ready for Christmas. The huge underground grotto is made up of fairy-lit walkways, colourful workshops and festive shopping stalls, so there is plenty to explore. Hop onboard Santa Park’s train and discover what happens behind the scenes in Santa’s toy factory. The journey will show visitors what the elves get up to during the different seasons of the year. Find out what it takes to qualify as one of Santa’s elves at Elf School. If visitors make the grade, they will earn the right to graduate and get a special certificate. Pop in to Mrs Claus’ bakery and help one of Santa’s elves put the finishing touches to a batch of freshly-baked gingerbread. Visitors can send a postcard to anywhere in the world from Santa Park’s Post Office for a local fee. Better still, it will get its own Santa stamp on it. Visitors never know how many ways there are to play in the snow until they visit Lapland, with reindeer and husky sleigh rides, snowmobiling, sledging and mini skidoo rides. With a taste of each, Fahy Travel will make sure visitors can squeeze in as many activities as possible by wrapping them up in a cosy snow suit to stay warm. Experience Lappish culture from a bygone era as a local shares age-old stories and legends about the region. Visitors will find them in the outdoor area of the park, in a traditional Lappish tent. No trip to Lapland is complete without meeting Santa, and now this is the chance to do just that. To really impress the big fella, ask the elves how to greet him in Finnish. When the day at Santa Park is over, Santa’s elves will take everyone back to the airport, ready for the flight home. Adult prices start from €679pp and child prices from €589pp. Low deposit and easy payment options are available.